We are very pleased to bring Tom into our organization. He is a strong fit and brings the background and experience we desire to continue to grow HFC and its subsidiaries. Financial executive with expertise in retail, consumer products and technology businesses, Tom Hillebrandt joined Home Franchise Concepts® as Chief Financial Officer in April, 2016. As CFO, he will serve as a trusted advisor and provide strategic input to Chief Executive Officer, Shirin Behzadi, and leadership on the strategy and direction of HFC with a financial and operational focus. 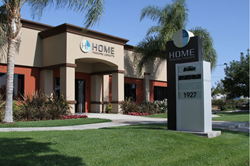 Home Franchise Concepts® (HFC) is parent company and franchisor of home improvement service companies that include Budget Blinds®, Tailored Living®, Concrete Craft®. Budget Blinds is the flagship brand that launched in 1992 and is the proven leader in custom window coverings across North America and ranked #1 in category since 1994 by Entrepreneur® magazine. Featured on NBC’s national hit show, Undercover Boss, Budget Blinds products have also been featured on Designing Spaces, Buying & Selling with the Property Brothers, and the Marc & Mandy Show and Love It or List It in Canada. Tailored Living proudly offers homeowners high-quality organizational solutions for their garages, closets, pantries, family rooms, home offices and more, through complimentary in-home consultations. The company also provides complete design, measuring and installation services adapted to each client’s specific needs. Tailored Living's industry experience, commitment to service, and wide breath of product offerings has allowed it to grow into the largest whole-home organization company in the nation with 195 franchise territories serving more than 2,000 cities throughout the United States and Canada. Tailored Living is regularly featured on TV hits such as George to the Rescue and Home with the Property Brothers. Concrete Craft offers full service concrete floor designs in eight territories across the U.S. and is the newest brand added to HFC’s portfolio.